Mohindar (centre) pictured with Michael Abbott AO QC (left), a long time supporter of the Spirit of India, and Ian Scobie (right), at the announcement of the Spirit of India Fund in 2014. It is with great sadness that we announce the passing of the extraordinary Dr Mohindar Singh Dhillon, who passed away peacefully in his sleep on the opening day of WOMADelaide 2019, just three days short of his 90th birthday on 11 March. 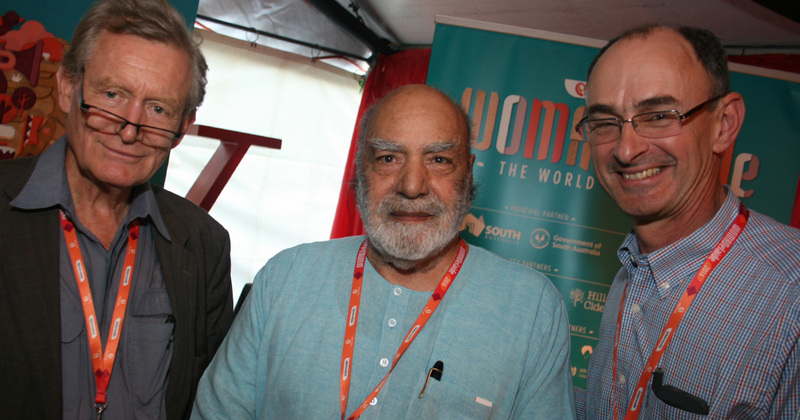 Mohindar had a warm and fruitful working relationship with WOMADelaide and Adelaide itself for more than 30 years. He will be greatly missed by his many friends and colleagues, but his legacy will continue through the WOMADelaide Foundation’s Spirit of India fund. Mohindar was from a land-owning family of Sikhs and was born in an Indian village (now in Pakistan) in 1929 in northern India. He graduated with a Master of Arts, English Language & Literature, Dux of his course, in 1950 at Punjab University, Lahore and then won a scholarship to Edinburgh University. Mohindar spoke fluent Punjabi, Hindi, Urdu and immaculate English and after a few unsatisfactory years in the Punjab Public Service, turned to teaching English from 1958-1974 at the University of Delhi. On moving to Australia in the 1970s with his English wife, Margaret, he taught English and an Asian Civilisation course at North Melbourne TAFE. Possibly inspired by his late father, a PE lecturer who trained and toured dancers in his spare time, Mohindar began to develop cultural links between Australia and India including taking cultural tour groups through India. In 1980 he founded the non-profit Nataraj Cultural Centre Inc in Melbourne with the aim of bringing India’s finest classical musicians and dancers to Australia and New Zealand. Mohindar first connected with Adelaide, which was to become the strongest supporter of his work, in 1985 when he approached the Confederation of Australian Arts Centres to help bring Amjad Ali Khan and two Kuchipudi dancers to tour Australia. The then Adelaide Festival Artistic Director Anthony Steel, who had encountered the work of Carnatic singer Madurai Seshagopalan in Singapore, suggested a combining of forces into a mini-festival of Indian classical performance and this developed into a four hour triple bill (including Indian dinner) which was given the title Spirit of India, a marketing banner that Mohindar then adopted for his subsequent tours. This first cooperative venture also saw the beginning of Mohindar’s long association with Rob Brookman and Ian Scobie, both of whom also worked on the 1986 Adelaide Festival and who subsequently worked with Mohindar over the next 30 years. The relationship extended further with the Festival when Lord Harewood, already a great lover of classical India culture, proposed an even more ambitious Spirit of India program with nine performances by seven different groups, a number of whom Mohindar toured more widely, including Shiv Kumar Sharma and Hariprasad Chaurasia. The Adelaide Festival relationship continued with Clifford Hocking in 1990 with Ali Akbhar Khan and at Rob’s 1992 Festival, which also saw the founding of WOMADelaide, with L Subramaniam. With the subsequent establishment of WOMADelaide as a separate festival from 1993, Mohindar then worked with Rob and Ian, and later with Annette Tripodi (Program Manager) to bring Indian artists to virtually every WOMADelaide and WOMAD NZ thereafter. Their artistic friendship extended further when Rob programmed the 1994 New Zealand Festival and introduced the Spirit of India to Wellington audiences, a relationship then long continued by Carla van Zon in future years. Mohindar’s attitude to the challenge of bringing such extraordinary work to audiences was ''Once people see the art involved in it they'll understand and appreciate it,'' he said in 2010 at the time of his efforts to bring Kathakali performance to Australia for only the second time. “When in India my great friend Mohindar was famous for publicly berating any of his fellow citizens whose conduct he felt fell short of the norms of polite society (most likely as practised in Melbourne). Yet he could also be an effective diplomat. On one occasion he, Ian Scobie and I were in a taxi taking us from Mohindar’s beloved India International Centre in New Delhi (to my mind one of the most supremely civilised establishments anywhere in the world), where we had been staying, along the hopelessly congested highway to Indira Gandhi International Airport. The car next to us evidently felt that our driver (just like that of every single other vehicle) was not always changing lanes according to the strict rules of the road. So a game of chicken ensued, with the cars swerving towards each other and then veering away again just before the moment of impact, until I was moved to say to Mohindar, “I think you should ask our driver to pull over as the other man has a gun pointed at us”. Both cars came to a halt and Mohindar, our taxi driver and the driver of the other car, who turned out to be an off-duty policeman, got out onto the tarmac. After a brief but quite nasty bout of fisticuffs between the two drivers Mohindar addressed the policeman, authoritatively I am sure but with a considerable degree of hyperbole. “I have in my taxi”, he said, “two extremely distinguished foreigners so I am sure you don’t want to cause any further trouble”. At that the policeman drove off and we continued on our way to the airport. A kind, funny and hardworking man – he produced his last tour at the age of 86 - Mohindar was acknowledged in the 2013 Sidney Myer Performing Arts Awards as “a trailblazer in multicultural performance. He was a producer and promoter of the most essential type – one focussed chiefly with the connection between artists and audiences. His relentlessness built bridges where none existed and fuelled enthusiasm for the highest quality Indian artists where once there was indifference”. In 2014 Mohindar announced his wish to leave a bequest to the WOMADelaide Foundation which then established the Spirit of India Fund to perpetuate Mohindar’s extraordinary cultural legacy by ensuring the continuing presentation of the finest exponents of Indian classical music and dance to Australia from India. The 22 tours of Indian artists presented at WOMADelaide jointly with Mohindar are listed below. They are a testament to his tireless energy, advocacy and firm belief in the power of art to enrich our lives. Donations to the WOMADelaide Foundation’s Spirit of India Fund are fully tax deductible, with the preserved capital sum being used to support the presentation of its cultural endeavours.